That the amount of time and money one contract manager said her company spent trying to implement a contract management solution. It still wasn't working. That's the amount another contract manager calculated her company wasted each month in productivity and time expense by using Excel and Outlook as their "free" contract management solution. That number did NOT include opportunity costs of renegotiating renewing contracts or inadvertently paying for duplicative services. The two scenarios highlight the conundrum for contract managers: buying, implementing, and using contract management software can be expensive, time consuming, and ultimately an exercise in costly failure. Conversely, doing nothing could be even more costly. This conundrum was most visibly manifested at the 2014 IACCM America's Forum in Chicago when in the midst of a presentation, Layne Jeffrey, the presenter, took an audience poll to understand what types of tools the audience used to manage their contracts. The answers were surprising. 60%. That was the number of hands that shot up, indicating that among IACCM members attending Layne Jeffery's presentation, the primary tool for managing contracts was Excel. Imagine if you were in a finance association and 60% of the professional finance people said that they were using Excel for all of their accounting an only 20% were using a solution specifically build for accounting like Quickbooks or SAP. The good news is that change is on the way. Whereas the choice up until now was between low-to-no expense solutions and costly, complex, fully-integrated solutions, today there are other options that fit in between no-cost and high-cost, fully-loaded solutions. Borrowing an analogy previously referenced, finance professionals don't have to choose between Excel and SAP- they have middle ground options in terms of price and functionality that include Quickbooks, Zero, Intacct, etc. The same range of options for contract management is emerging today. 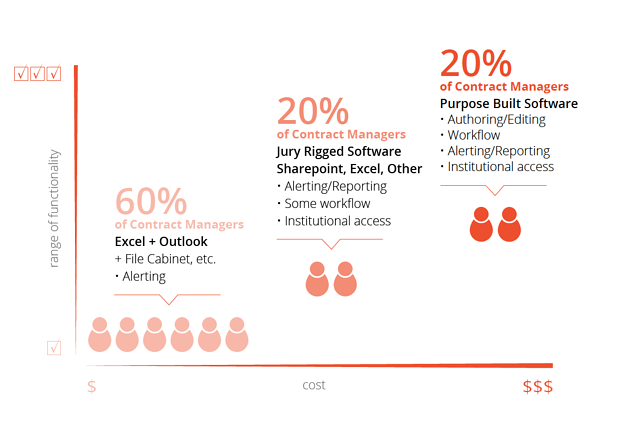 As software development and infrastructure costs decline, software makes can focus on niche verticals and unique work functions like contract management. In 2000, LoudCloud estimated the cost of running an internet application was $150,000/month. Today, that same software-as-a-service application would cost $1,500/month, or 1/100th the cost of 15 years ago. So, how do you know you need a solution? And if you do need one, how can you narrow the field of 100+ options down to a few that will provide the best fit for you and your company? Is there a framework you can apply in terms of company adoption and solving your core problems at a price point and complexity that won't kill you? After conducting our interviews, we found that a company's contract management needs (or problems) typically fit into two categories: the post-award category, which included problems relating to renewing contracts, missing contracts, compliance, risks, etc. and the pre-award phase that included problems relating to approvals, workflow, authoring, negotiating, etc. Regardless of where your company fits in terms of the contract management problems it would like to solve, the good news is there is now a solution out there for you. You no longer have to sit behind the technology curve. For the framework we've put together, based on our interviews, on how isolate your business' s specific problems and what types of solutions to look for, please download our white paper here.